No one stays alive on Slaughter Drive! 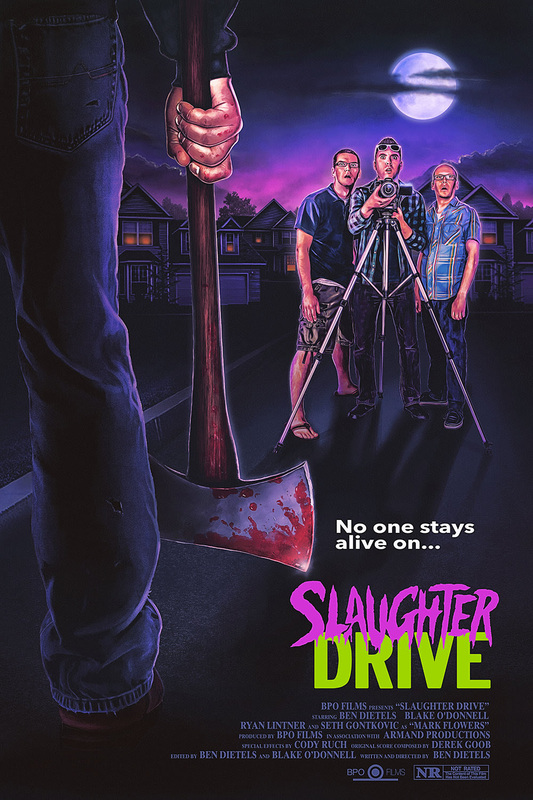 The Steel City is best known for NIGHT OF THE LIVING DEAD, but writer/director Ben Dietels is set to make his own mark on Pittsburgh and horror movie fans with the 80’s homage, SLAUGHTER DRIVE. SRS is proud to bring you this must-see indie horror flick on DVD, Blu-ray and VHS. When failed filmmaker Doug Stevenson leaves his video camera in the local park overnight he accidentally records something horrific. To top it off it might have something to do with his new neighbors that moved into his quiet suburban neighborhood. With the help of his bumbling teacher buddies Doug goes on a wild ride to save himself, his friends, his ex-wife, and the entire neighborhood! Featuring a killer throwback soundtrack and splattery practical FX find out who will stay alive on Slaughter Drive!